UNESCO has called for measures to preserve the HMS Victory, British man-of-war that sank in the English Channel in 1744, following its discovery by a commercial deep-sea exploration company. UNESCO stressed the need to safeguard such a historically significant find, in light of its Convention on the Protection of the Underwater Cultural Heritage, which entered into force this January. 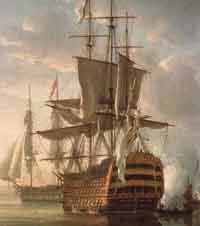 The discovery of the wreck of the HMS Victory was announced on 2 February by the explorers who found it, off the Channel Islands where it sank during a storm in 1744. The Royal Navy vessel went down with all hands, with no survivors among the approximately 1,000 men aboard. Besides human remains, the ship is thought to contain a number of bronze cannons, historical artefacts and a sizeable shipment of gold. Just over a year ago, in 2007, the same commercial exploration company recovered the contents of another shipwreck, of Spanish origin. Of great historical value, the wreck also contained several hundred thousand silver coins. Legal proceedings are ongoing because the Spanish government was not consulted before the recovery. Spain claims ownership of the wreck and the inviolability of its archaeological sites. UNESCO’s Convention on the Protection of the Underwater Cultural Heritage, which entered into force on 2 January 2009, has been ratified by 22 States. * The United Kingdom has not joined the States Parties to date, but it has expressed its willingness to comply with the Convention’s Annex, which establishes ethical and scientific Rules, widely recognized by archaeologists, for activities directed at underwater sites. The Rules notably state that commercial exploitation of underwater cultural heritage for trade or speculation is fundamentally incompatible with its protection and proper management. They do allow, however, for work by professional archaeological services in conformity with recognized ethical and scientific rules, and subject to the authorization of competent national authorities. The Convention aims to ensure more effective safeguarding of submerged shipwrecks and ruins. It represents the international community’s response to the increased looting and destruction of underwater cultural heritage, which is becoming ever more accessible to treasure hunters. It does not arbitrate ownership claims concerning shipwrecks nor does it prejudice the jurisdiction or sovereignty of States under maritime law. The treaty is based on four main principles: the obligation to preserve underwater cultural heritage; in situ preservation, i.e. under water, as a preferred option; no commercial exploitation of this heritage; and cooperation among States to protect this precious legacy, to promote training in underwater archaeology, and to raise public awareness of the importance of sunken cultural property. The first meeting of the Convention’s States Parties will take place at UNESCO on 26 and 27 March.